atterned on Ojibway and Algonquin styles, the eight-metre North Canoe was built of birch, birchbark, white cedar, and spruce. In fur trade use it would carry about two tons of freight, two passengers, and six paddlers. Moving in "brigades" of three or four, these vessels averaged thirty miles (forty-eight kilometres) each day, including overland portages. A run to the Pacific or Arctic from Fort William (Thunder Bay) could take three months - with an equally long haul back to the Great Lakes the next season. 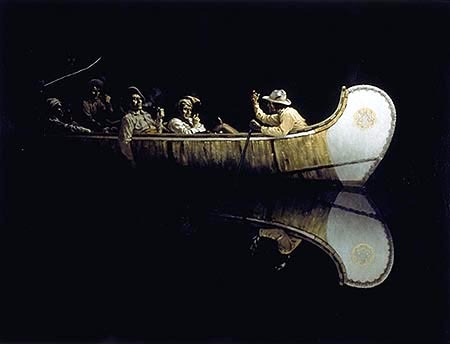 n addition to portraying both Montreal and North Canoes, the artist shows heavier handpowered and sail-rigged watercraft in regular Hudson's Bay Company use. 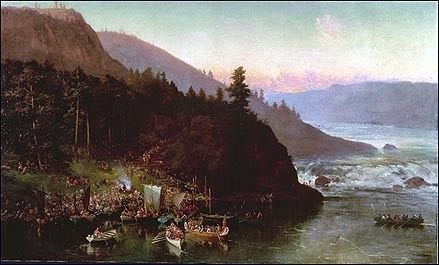 She also reveals how fur trade vessels and their cargoes were portaged around rapids or falls. 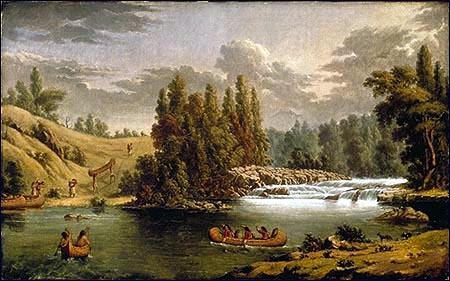 his scene of portaging around river rapids plainly shows the ease of handling birchbark canoes on both water and land.